No teal beads? No problem. I picked up a package of Jesse James Design Elements beads in “Mystere.” For only $5.99 you get a packet of gorgeous and chunky beads all in the same color family. 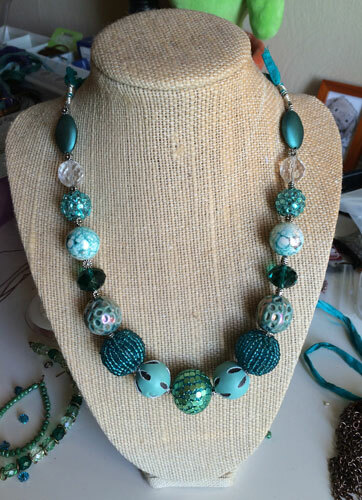 It’s a very cost-effective way to build a nice statement necklace. I strung them on heavyweight beading wire along with pewter spacers that I’ve had for years and attached it to some teal sari silk. It ties closed behind the neck. Now I just need something to wear it with!